Netflix shareholders want to know if the stock will suffer any "Arrested Development." Fans of the quirky TV show are now devouring the long-awaited fourth season of the show, available exclusively on Netflix. But reviews of the cult series were mixed, at best, after the original production series was released Sunday night. Netflix (NFLX) shares tumbled $14 Tuesday -- a drop of 6 percent. 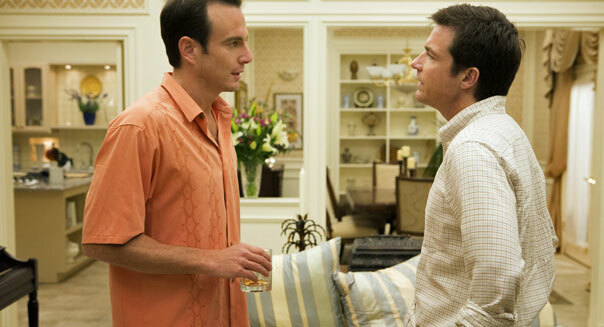 Michael Yarish/AP/NetflixActors Will Arnette, left, and Jason Bateman in a scene from "Arrested Development." But it's still trading near an all-time high, above $200 a share. So investors want to know if the decline was a "sell on the news" reaction or a sign that the stock is overvalued. The stock was slightly lower in trading Wednesday morning. It has soared 135 percent so far this year, making it the best performer on the S&P 500 (^GSPC), partly on high expectations for its original programming. The "House of Cards" series, starring Kevin Spacey, has been a huge success. Netflix has 36 million subscribers worldwide, but it doesn't provide viewership numbers. However, some private firms indicate that "Arrested Development" attracted a huge audience in the first 24 hours that it was available. Appearing on CNBC this morning, company CEO Reed Hastings said only that the debut "met expectations." The company released all 15 episodes of the new season at once, hoping to attract lots of new subscribers. But some analysts worry that many fans will sign up for a free trial of Netflix, do some binge viewing of the show, but not sign up to pay $7.99 a month. So any subscription boost could be short-lived. And the reviews of the show may not help. Variety said the new season "plays a bit like a reunion special." One problem is that the show's ensemble cast members -- Jason Bateman, Will Arnett, Jeffrey Tambor, Jessica Walter and others -- are now stars in their own right and involved in lots of other projects. As a result, many of the new shows feature one cast member, and the entire cast was never able to get together. Netflix is making a big bet on original programming, trying to take a page from the playbook of Time Warner's (TWX) HBO in order create some buzz and attract new paying subscribers. It's committed tens of millions of dollars during the next several years on more original programs, including "Orange is the New Black," due out this summer.